Previous PostTips on dealing with freelance web designers or developersNext PostWill booking your accommodation directly with the property give you the best deal? We just received on of these letters… They were asking $980.00 to publish for 2 years?? I googled them to discover to my shock that its a scam… It is really sad that obviously intelligent people would spend time and money designing ways to rip business people off. We agree – it’s disappointing that people and organisations out there make their living from scamming people, rather than working to earn money legitimately. And for the people who have been scammed, they are tricked into parting with money they have worked so hard for. Extremely unfair and unethical. At the end of the day, this sort of scam is a game of numbers for the perpetrator. Even if just one percent of those many people they send these invoices to actually pays, then they pocket many thousands of dollars instantly for little more than the cost of a few postage stamps. If Australian consumer law agencies can’t or won’t take action, then the best we can do is spread the word so that no one falls for their scam. Looks like IDRTM (TM Publisher) have recently implemented a price increase for their trademark scam. Maybe they aren’t convincing as many people into paying as they did previously, so they have to increase their fees to make up for the drop in revenue! I thought that this was a scam and great to have this confirmation through sites like this one. I was aware that this was a scam as the trademark is just a photocopy. Once before I received another scam while my trademark was being registered through my lawyer, two years ago now. I gave my lawyer a copy of the scam at the time. This time the money being asked to pay is $980.00. Money that could easily pay other bills! Just received one of these and could tell staright away – SCAM. Nice try people! Just received an invoice from IDRTM. Shame on you as we are a community organisation and yes have been caught before so never again!! Glad to hear that you did a search on the web and realised via our blog posting that the IDRTM invoice is a scam. The more people that are aware of it, the better, particularly for some businesses and organisations that tend to blindly pay invoices when they arrive without giving too much thought to what they are actually for. I’m sure the $1,000 that the invoice was for would be much better put to use in your local community helping others rather than lining the pockets of scammers whose make their living only by cheating people out of their hard earned money. We have just received this letter as well and we are a business based in Queensland. Is there anywhere we can report them – is it illegal? We are pleased you identified that letter from IDRTM / TM Publisher as a scam, as unfortunately some people have simply paid the fee, assuming it was either a necessary requirement or recommended component of their trademark registration process. Technically, what they are doing is probably not illegal, as they “recommend” you publish your trademark in their directory. However, their intentions for doing so are not honourable. Their letter is structured like a bill that has to be paid – something that could, in a large organisation, be blindly passed onto a busy accounts department to pay. Also, while their letter doesn’t explicitly state so, it is possible some people may have the impression that by paying the bill, their Australian trademark will be automatically registered overseas. It is very important to realise that registering an Australian trademark provides protection only within Australia. Paying IDRTM / TM Publisher $980 will not offer any protection internationally. Just got one for $1320. Googled to check it wasn’t a scam & lo & behold!!! It’s great to hear that when these “bills” arrive in the mail, not everyone is just blindly paying it, and that people are actually making the effort to use Google to check the authenticity of it. The most effective way of forcing these scammers out of business is public awareness, so the more that know about the dodgy activities of IDRTM / TM Publisher, the better. As soon as the cost of printing and sending out those unsolicited bills exceeds the revenue of people paying them, they will close down. Google can be very useful for identifying scams. The more people that type “IDRTM” into Google and see the resulting pages and pages of scam warnings, the better. Public exposure is the only way to close these dodgy people down by hitting them where it hurts – i.e. their income stream. Each time someone realises a trademark directory bill from them is a scam, it’s another $1,000 less the scammers earn. Glad to hear that you are spreading the word on your Facebook page about the IDTRM / TM Publisher trademark scam. It’s a great way to raise public awareness of this issue. This is the second scam invoice from these people that I have received – the latest today. If the Commonwealth Bank is aware of this scam then maybe they would close the account???? Yes, IDRTM / TM Publisher seems to be flooding Australian trademarker owners right at this moment with “invoices” to be listed in their international trademark directory. Unfortunately the Commonwealth Bank can’t really do much unless IDRTM / TM Publisher is prosecuted for breaching Australian consumer laws. And even if the Commonwealth Bank closed their account, you can be sure they would open another one elsewhere in order to continue the scam. The more people that are aware of this trademark scam, the more chance IDRTM / TM Publisher will go out of business, as their dodgy source of revenue will dry up. Keep spreading the word! Still happening…. I used to get dodgy ones from OS “Providers” but it’s a bit audacious that they are now using an Australian address and bank account and also pretty pathetic that some authority can’t shut it down. Yes, it is unfortunate the scam is continuing. 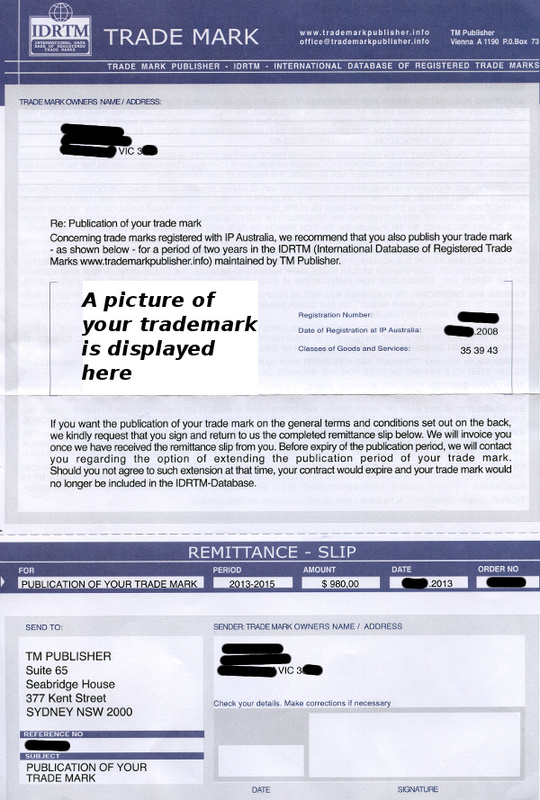 IDRTM / Trade Mark Publisher are certainly going all the way trying to convince people to pay up by using an Australian address and bank account. These scammers are experts at their game and are certainly skating on very thin ice when it comes to the legality of their operations. We are glad so many people are identifying the IDRTM / Trade Mark Publisher scam and swiftly depositing their invoice in the bin. Thanks for sharing this. I just received the scam invoice today from IDRT. Have to say it’s one of the more convincing ones – having an office address in Kent Street, Sydney too. Yes, these trade mark scammers have certainly gone to a lot of trouble by providing an Australian address and setting up an Australian bank account in order to trick honest businesses into parting with their hard earned money. Spreading the word is the only guaranteed way to ensure they don’t scam any more Australian businesses. Thanks a lot for posting this information. Yes, we received one such notice today. Yes, the only way of stopping these scammers is to spread the word. Thanks very much for this article. I received an identical letter last week. The fee asked for was $1,320 ($1,200 + GST). I only stopped to check because I received a similar email scam 6 months ago. I wonder is this can be shut down for committing fraud? It’s fantastic that you identified the letter by TM Publisher as a scam. Their whole business model is reliant on people assuming this is a legitimate cost associated with their trademark registration and thus assuming it needs to be paid. In the case of large organisations, they hope their letter / invoice is passed onto a busy accounts department, along with hundreds of other bills, increasing the likelihood that it will slip through without any investigation and be paid. “Worldwide publication in IDRTM Info-Database allows the trademark owner the publication of his trademark after the principle to find and be found”. In other words, after one deciphers that meaningless statement, people who pay the invoice will get a listing on a private website which gives no real benefit to anyone except for the income stream of IDRTM / Trade Mark Publisher. Glad to hear that you Googled IDRTM / Trademark Publisher and realised that the bills they send out are designed to defraud trademark owners and businesses. Now if everyone who received those letters did the same, IDRTM / Trademark Publisher would swiftly go out of business! Thank you very much for sharing this article. Our company just received a letter from IDRTM, we thought it is an official legal entity that belongs to trade mark. Lucky I saw this article before we make the payment. The amount now is $1320, what a robber! You’re absolutely right – paying $1,320 to have your trademark listed on IDRTM’s website is not only a waste of money, but absolutely and completely pointless. Luckily you realised it was a scam, but some trademark owners are still being fooled into thinking they need to pay that bill as part of the official registration process for their trademark. Of course that is not true at all. Registering a trademark is an expensive business. IDRTM preys on the fact that trademark owners have made a significant financial investment, so they try to slip in an extra bill related to the trademark, hoping it receives no scrutiny and is paid without a second glance. Just received one for $1320 today too. So glad I googled it! Glad to hear that you saved $1,320 today by using Google! Unfortunately not everyone who receives those exorbitant bills by TradeMark Publisher / IDRTM does a check to see if they are really part of the fees required to register a trademark. If everyone did, they would be confronted by pages and pages of warnings in Google about this trademark scam. The lesson here is when in doubt, Google it! Thanks for this post, just saved a national New Zealand charity over a thousand dollars. So it seems that the scam has made its way across the ditch. Yes, unfortunately the trademark publication scam is not confined to Australia, but is a world-wide scam that has been running for many years. Obviously the people behind it have no ethics as they have targeted your charity which is there not to make a profit, but to help people in need. You have to wonder how many other charities that TM Publisher, through their IDRTM database, have tried to scam money out of. What’s really worrying is that probably some of those have paid up, resulting in less money and help available to help needy people. We can all fight back against this scam by ensuring greater awareness so that others don’t get tricked into paying them. Once their income source dries up, they go out of business. Let’s hope that say come soon. Yes, this scam has made its way across the ditch and, in keeping with their usual thorough approach to trying to fool the unwary, TM Publisher are using a Wellington address here. Hopefully people in New Zealand will not be tricked into paying TM Publisher with their trademark scam. Can you list here their Wellington address so that people searching for it will find this posting? Unfortunately not everyone immediately identifies the bill TM Publisher sends out as a scam, as those people are still in business, trying to trick people into paying for something they don’t need. Interestingly enough, the address that Mike (see comment dated 10th March) said is on the bill, Level 31 at Plimmer Towers in Wellington, appears at first glance to be very impressive. A tall building in central Wellington, once the city’s tallest building – so it seems the bill has been issued by an authentic and trusted organisation. Very convincing. As it happens, Level 31 in Plimmer Towers consists of virtual offices which you can buy use of for rates starting at $100 per month. For a legitimate service, it would appear like they are slumming it! But of course, all this is a scam, convincing people to part with their hard earned money for just a simple entry on an unofficial website. I’m NZ based and just received an invoice for $1638.00 too. Please I troubled to check out the validity, so sorry IDRTM but no donation from me. Oh dear, poor IDRTM misses out on yet another gift of $1638! But seriously, it is really good people out there are bothering to check things out and not blindly pay the bill that arrives in the mail. The world is full of scammers who prey upon those who are too trusting or those who simply pay bills without giving too much thought to what they are actually for. They are still at it, I am in New Zealand and received a letter from IDTRM today asking for $1638 NZD. Something didn’t seemed right so googled etc and I am glad I checked. Well spotted Tracey – Google is your friend! It is a timely reminder that if anyone has any doubts about the authenticity of any bill they receive, particularly when it is a very large sum like the $1638 NZD that IDTRM is requesting from businesses all over New Zealand, then they should spend a few minutes investigating the source of the bill and exactly what the money buys. In the case of IDTRM, you may as well flush that $1638 NZD down the toilet. Yes, it seems that these “bills” are going out to a wide range of trademark owners. Mind you, with the exorbitant pricing they are charging to be listed in what they make out is virtually a mandatory directory for international trademark protection, you would think they could afford send someone around to personally sign you up and process your payment. But you are right – the unpaid envelope is a clear sign that the scammers are operating on the cheap. The only way to shut these people down is to raise awareness, so thanks for sharing your experience here. Also – can anyone else respond. Mine came in a British Royal Mail envelope – when I saw it I instantly thought it was to do with my time in the UK on OE many years ago – but that looks like where it is originating from. Yes mine too had Royal Mail from uk. It has now hit NZ. Thanks Geoff for letting us know you have received one of those scam invoices from IDTRM. Spread the word, so no one gets tricked into paying those people money for something they don’t need. I just received one in NZ too – thank goodness for this post and my friendly IP consultant, alerting me that it is a scam! It did seem dodgy that my business logo was such dreadful quality. Still, I was quietly freaking out for a few minutes there. Thanks Nicola for sharing your experience with us in relation to the IDTRM trademark scam which is going around New Zealand at the moment. As you’ve illustrated, it’s not just the money that people stand to lose, but these unsolicited bills cause undue stress and waste the time of the trademark holder as they investigate what it is all about. We can only hope no one in New Zealand blindly pays their exorbitant bill – it just feeds these scammers and they’ll just keep at it. So true! It took up quite a chunk of my afternoon – time much better spent on other things. Note that they’ve increased the price again too – it’s now $1638.00! Good to see that scammers can at least keep track of inflation. It’s hit New Zealand. We have just received one for $1638 yesterday. It’s from Egham in United Kingdom. I too have got a account for $1638.00 they have got a anz bank account number. I intend to give info. to anz. Then checked their website, it wasn’t hard to smell a SCAM. Yes, it looks like New Zealand businesses and trademark owners are currently being bombarded by letters from IDTRM requesting payment for a trademark listing on their obscure website. It’s great to hear that so many people are instantly recognising that it’s a scam and saving their $1,638. I received one of these too in NZ, its got an ANZ account listed so reported it to the bank. They confirmed the scumbags account has been put on hold just recently. So now if anyone tries to pay them, the payment gets bounced back. That’s great news to hear that the ANZ Bank have put a hold on IDTRM’s bank account. It’s a shame banks in other parts of the world aren’t doing a similar thing. Thanks for letting us know that IDTRM have set up a new Australian bank account, with the aim of tricking more trademark holders into paying exorbitant fees for very little return, by sending out an unsolicited invoice. Their “fees” have obviously increased well in excess in inflation and yet there are still people out there who are happy to part with their hard earned cash, otherwise this organisation would be out of business by now. If the invoice you have received looks a lot different to the older one we have published, feel free to email us a copy, and we can publish it (with your personal details removed) so people can more easily identify it as a scam. all looks legit, even the Commonwealth Bank account number. Seriously these scammers have to be stopped. TMP will not be responsible or liable for any error, act, omission, failure or delay with regards to the IDTRM website…. You’re absolutely right – small business is going through a tough time in Australia. Despite this, we have overseas-based organisations like IDRTM, with local representation, preying on those who own trademarks and trying to fleece them of large sums of money with an unsolicited bill for a listing within a pointless directory. While IDRTM is rolling in the millions, hard-working Australians are being bombarded with these false billing scams, and clearly people are falling for it, otherwise it wouldn’t be continuing. One of the problems here is that pro-forma (unsolicited) invoices, which is what IDRTM is sending out, are not illegal in Australia, yet in many countries overseas, this practice has been banned. At the moment, all we can do is try and increase awareness of what is going on to ensure people don’t fall for the scam. Spread the word! June 2016 They are still at it. Now it is $1,478 for two years. May be IP Australia can send out warnings when someone registers IP. That’s actually a good idea. That way when people register or renew trademarks, they will be aware that scam artists like IDRTM will be preying on them and trying to get them to pay for something they don’t need.